We all love a good story. So, getting to hear how one of the best modern storytellers creates his fantastic tales was too tempting to pass up. 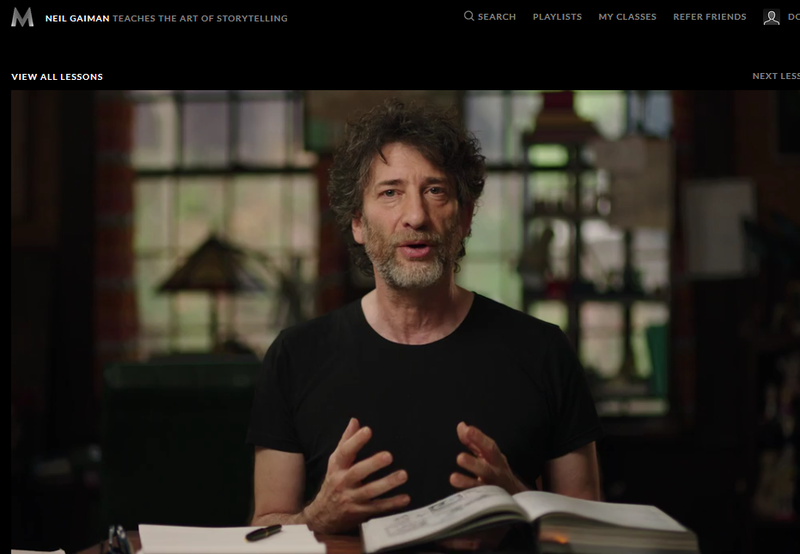 This unusual masterclass course by Neil Gaiman was a great way to while away a few hours. Below, I share with you what you can expect from it and why I enjoyed it so much. 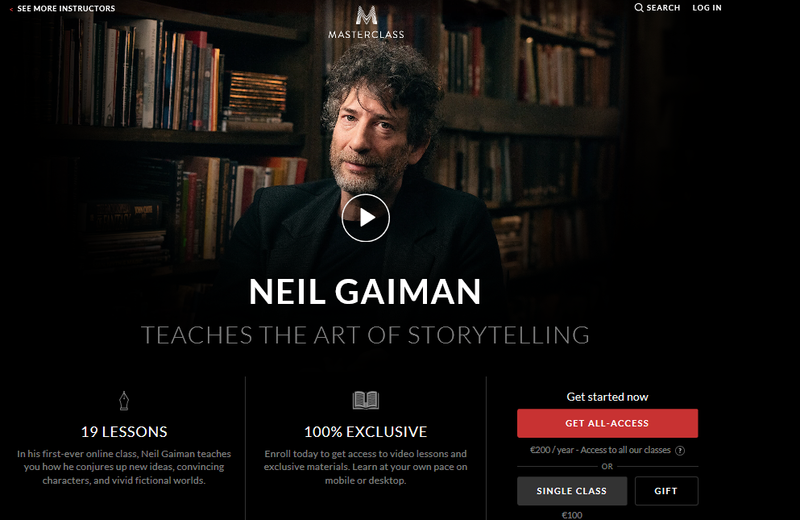 I am ashamed to say that before taking this course, I had never heard of Neil Gaiman. My loss, for sure. Neil Gaiman is clearly a brilliant storyteller. Over the years, he has won a long list of literary awards. For example, he has won multiple Harvey Awards for his comic book series The Sandman. He has also won several Carnegie medals including one for his young adult novels. Plus, Neil’s book The Ocean at the End of the Lane was voted as Book of the Year in the British National Book Awards. Neil writes in all kinds of formats and is a performer too. He is well known for his comic-books, novels, radio plays, films and screen writing. So, if you want to learn how to tell a story, Neil is the man to listen to. Stories are part of us and we convey truth with stories. Neil starts his course in an interesting way, which revealed to me something I had never considered before. I won’t spoil things by telling you what it is, here. Storytelling is a part of every culture and has been for literally thousands of years. It is how important truths are communicated, in a memorable way, and passed on down the generations. Neil clearly has an amazingly vivid imagination. So, I was very surprised to find that much of his inspiration for his writing comes from everyday life. 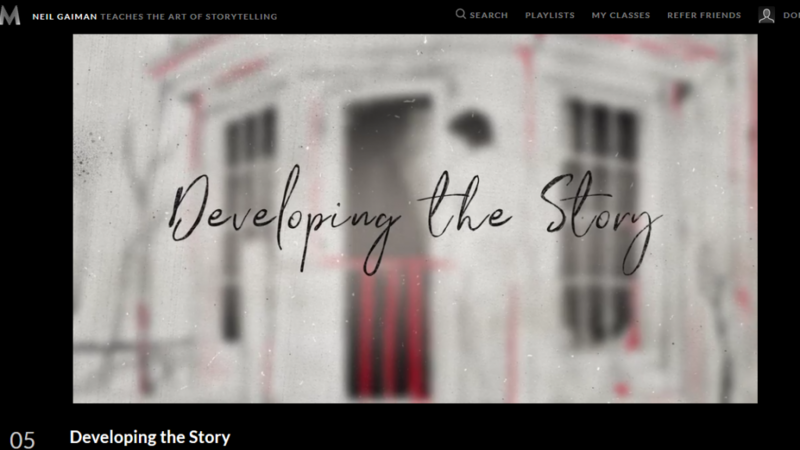 In this lesson, he also explains how to take a story, deconstruct it and rework it. He demonstrates this technique by re-interpreting some classic fairy stories. A very interesting, if a little disturbing, part of the course, which I keep coming back to. This is just two examples of where you can get inspiration for a story. Neil provides you with several others during this video and the rest of the course. When Neil started this section, I can remember feeling a little irritated. I could not understand why finding your voice is important. But, by the time I reached the last part, I could see why every writer needs to find their voice. Perhaps more importantly, Neil explains how to find and develop the voice of your characters. As a writer, you are playing a game with your readers. Neil calls this the “what’s going to happen” game. You keep them guessing, which motivates them to carry on turning the pages. Neil explains how to structure your story so that it draws your readers in. One of his best tips is to write down everything you know about the story, the characters, and the subject. Kind of like a brainstorm for one person. When you do this your mind starts to notice connections. As you progress, a single idea is embellished and starts to form a mass. A body of work that you can then shape and craft into your story. At this stage, I am going to share a couple of things with you that niggled me a bit about this course. Don’t get me wrong it is excellent. But, the fact you have to read the workbook to get the story planning and other parts of the process down properly, was a bit annoying. I should not be surprised by this because I also noticed it with the other writer courses I took. They are writers after all. So, naturally, the written word is the medium they communicate best in. (By the way, take the time to do a couple of the exercises that are included in the workbook). It would be nice to be able to order a printed copy of the workbook, but, as far as I can see this is not a service that masterclass.com offers. At least not yet. Although, as you can see when you read my full masterclass review, you do get quite a few extra resources when you take their courses. Short stories are not really my thing. I rarely read them and I have never written one. So, I confess I skimmed over this section of the course. At least the first time I took the course. The fact that Neil spent the first 4 minutes of one video, in this section, reading a story aloud did not help. Plus, at this point, the fact that Neil speaks very very slowly began to frustrate me a bit. However, that said, if you want to learn how to write this genre I am sure you will find it helpful. For example, his tip about minimizing the number of words you use, when writing a short story, seems counter-intuitive. But, I know, from experience, that this is excellent advice. I write a lot of blog articles, so know for short pieces, less is definitely more. The more concise you are the better it reads. In fairness, the case study video was excellent too. You will love the unique way he came up with the plot for his Blackberry piece called “March Tale”. But, once again, it was the workbook I learned the most from. It was clear from this section of the course, that getting the dialogue right is essential when it comes to character development. Something that I can tell you from experience is very hard to achieve. I once had a job transcribing interviews, and writing a shorter version. Whittling 5 or 6,000 words down to about 1,500, while still sharing the main points was tricky. The fact that I had to reflect the voices of the interviewer and interviewees too, made things even harder. I ended up loathing that job and gave it up. If I had taken this course before starting that job, I am pretty sure I would have found things a lot easier. 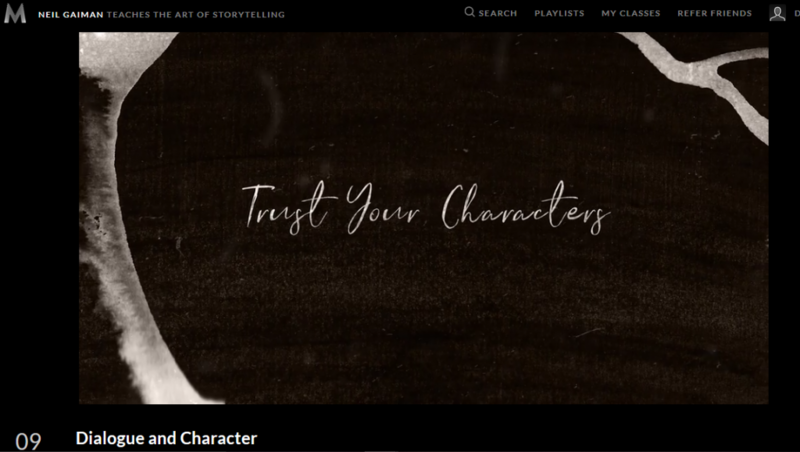 Neil explains, in detail, how to give your characters their voice. His method is to start with how that person looks and deciding what their characteristics are. Where they have come from and how that has shaped the type of person they are. However, there were things I could not quite grasp in this part of the course. I struggled with the idea of tapping into the part of you that is female or old when you are a young man. Neil assures his students they can do this, but, I was not convinced, which is one reason I doubt I will ever become a fiction writer. This part of the course was fascinating. Neil describes it as “getting to play god”. Interestingly, Neil’s advice is to start the process of creating your world by spending time in real places. Really experience it, notice the noises, the smells, the things that make them different. Asking yourself weird questions like how do all these people get fed? will help you to embellish the world you are building. A process that makes it seem more real. His tip on how to work out the rules in your fictional world is a particularly interesting one. Neil says that humor is good for anything you do. Something I agree with but struggle to inject into my writing. Sadly, I don’t think I will be solving this problem any time soon. In this video, Neil reads us an entire kids book, then explains what he did to create it. The problem is I don’t see it as a funny haha book. It is quirky and fun, but not comedic, which is what I thought Neil was going to cover in this section of the course. So, I was a bit disappointed. But, there are still some good tips in there. For example, putting the funny word at the end of a sentence. Plus, I got to hear about his work with Terry Pratchett and how he made his readers laugh. If you want to sell books, lots of them, you must not disappoint your readers. So, it is great to see Neil explaining how to understand what your readers are expecting from you and how to meet those expectations. Doing this is not as complicated as it seems. Working out if you are writing a genre book is step one. Once you understand if that is the case, it is relatively easy to understand what the reader is expecting to see included in the plot. Provided you weave these in, in some form or another, your reader will not be disappointed. This writing process was completely new to me. So, I really enjoyed this section of the course. 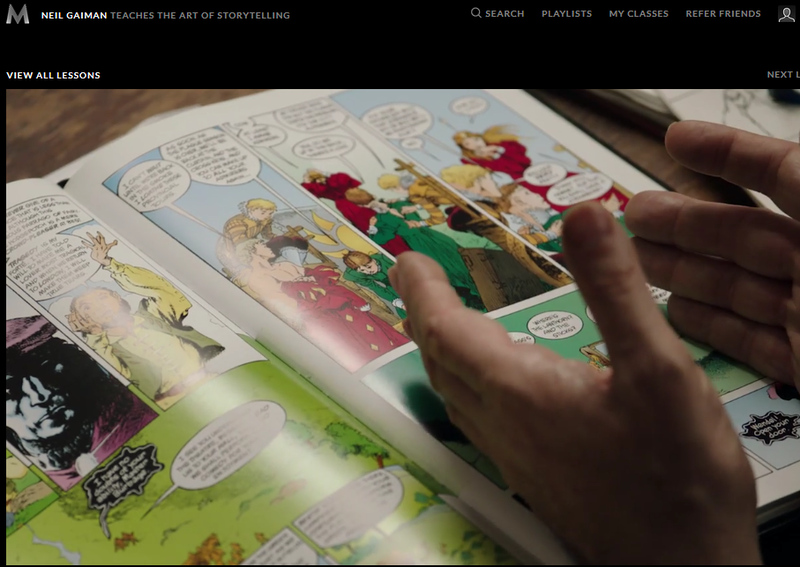 Neil lays out the entire comic writing method very clearly, literally step-by-step in a single 27-minute video. It made me realize that I could write a comic, even though I cannot draw, at all. You still need to lay the story out in pictures as well as words, but your drawings do not have to be elaborate, at all, Neil’s aren’t. Potentially, because the notes are for your reference only, you could even do it using stick people. Neil’s take on writer’s block is great. His is a no nonsense approach, that includes several techniques, which I know, from experience, are very effective. When you have written something, editing it is not easy. You just do not see your mistakes. This is the case regardless of whether you write a letter, an essay or a blog article. With something chunkier like a book, screenplay, comic or a play you also need to check the story and see it through the eyes of your reader. This makes the process even more complicated. Fortunately, Neil takes you through everything, step-by-step. Plus, he outlines it all in his workbook. No doubt about it, Neil’s fans will love this course. So, will budding writers, especially those that want to learn how to write short stories and comics. There are not many courses that cover these styles of writing. I will certainly be going through it several times more, even though I am not planning to switch to writing fiction. There is still a lot I can learn from Neil. When I took this course, I had already completed 2 of the other writing courses that are on offer at masterclass.com. One by Dan Brown and the other one by James Patterson. I enjoyed both of them. What was interesting to me was just how different these courses were. Each author offers up different tips and tricks and has a different teaching style. So, my advice to you is to spend a little extra and buy the all-access pass. It really is worthwhile. In fact, doing so will save you a lot of money. When you buy the pass, for the same price as two masterclass courses, you get access to all 50+ courses.